Using the API, certain functions can be executed from an external system (LMS, user registration system, etc), like adding users or subscribing learners to a course.Using WebHooks, an external system can receive a message when, for example, an activity is finished by a learner.Using Single Sign-On (SSO), users from an external system can be logged on to the platform without needing to enter their username and password again. SAML can also be used for this purpose. With the API, certain functions like the addition of users and the subscription of users to a course can be executed from an external system, for example, an LMS or a user registration system. You will find a further explanation in this file. 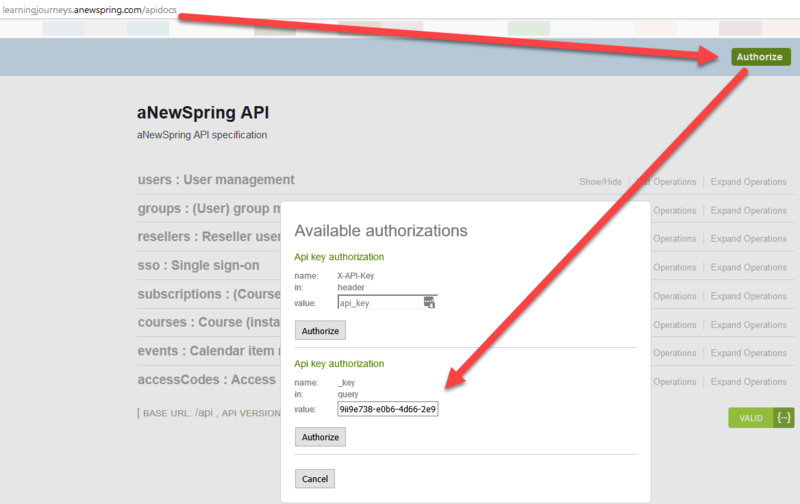 To establish a connection with aNewSpring, you will need a API key, which you can request from our Support. API specifications can be found by adding /apidocs at the end of the url of your environment. Please fill in the API key you received from Support and type it in at the top-right corner. When you have done this, you can begin testing the API.